Why do we need a muslin? I hope that all of those who participate in the sew-along know the importance of a muslin. It's a replica of the future garment to which you'll be able to make all necessary adjustments and tweaks. 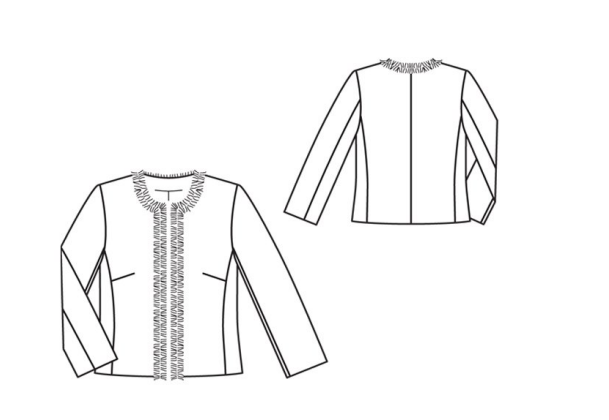 Your muslin will help you modify and play around with your initial idea of the jacket you were dreaming of for so long! For our muslin, we will be focusing on stitching lines, and the clearer they are the better. So first thing, you need to trace nicely your pattern. If you took Susan's Craftsy class The Couture Dress , you will have seen the kind of tracing paper she used. These are big ( 66cm x 99cm/ 26" x 39") pieces of wax tracing paper which leave very beautiful marks on your muslin. You can buy this paper on Richard the Thread website but they have a minimum order of $35 which equates to 3 sets of tracing paper. You might find it expensive, but it is definitely a good investment. One year after I purchased it, I am still using one sheet of each (mainly red and white) and I have to tell you that I do trace a lot. For each garment I make I probably trace 2 muslins on average, sometimes more. So if you think about a long term investment and high quality product, definitely buy this! It's also important to transfer all markings onto your muslin including grain lines, waist lines, pocket placement (if there are any). There is no need to mark notches, though. Leisa told me that A Fashionable Stitch also sells wax paper as well as Oliver S in case you don't want to commit to a $35 purchase. Also, both New York Mood and Pacific Trimming keep a significant stock in their shops. It is very important to leave large seam allowances on your muslin. When fitting it, you might add significant changes requiring more fabric that you have planned for in the beginning. For instance, you might want to add more length to your jacket. Again, if you know Susan's Craftsy lesson then you'll know the way she recommends to put it together. If not, I will explain. Once your muslin is traced and all the markings are transferred, use the longest stitch to baste all the stitching lines (3.5 - 4) and all markings, including darts: the stitching lines are going to be your main reference. You need to thread-trace for a few reasons, one of which is to transfer the information on both sides of the muslin. Having each of your pieces thread-traced helps you to see and feel it from either side. It's recommended that each thread-traced line is independent. It is also very important to write pattern pieces' names on your muslin and specify whether it's the left or right piece. If a piece is confusing and can look like both top and bottom, also indicate this on the muslin. I did this mistake on my couture sewing class with Susan and I suffered. There is another way to put a muslin together, which I personally prefer to Susan's and which I use for my LFJ: let's call it industrial. This method is much faster and in most cases as efficient as the couture one. It won't make a big difference for our jacket because the jacket will sit rather loosely verses an evening gown, but also because we will do another fitting of the garment once it's quilted. So all of the necessary final tweaks and adjustments can be made then. Fitting and Pattern Alternation: this books describes any possible pattern alteration you can think of. It cost a little bit of money, but with this book you won't need anything else. It will quickly become your go-to fitting guide. 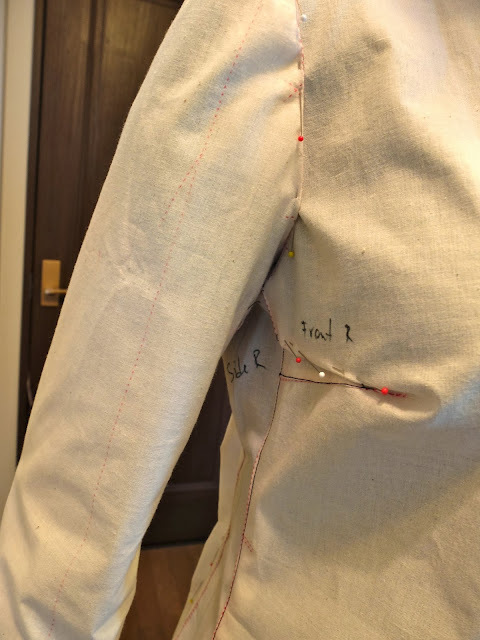 Threads Magazine offers a series of articles about fitting, some of which will be helpful for our little jacket: bust, torso, arms. There are a couple of Craftsy lessons dedicated to fitting: Sew the Perfect Fit, Fast-Track Fitting. Personally, I have not tired them, but if you have and would like to share with us how they are, please go ahead! To mark all possible alteration, I use a soft-tip pen or marker. On the photos below, I'll show you my alteration and how I dealt with them. I chose to work with a Burda pattern #109 from 03/2012: no princess seams and two-piece sleeve. After the first fitting, I realized that the "boxiness" of this pattern does not suit my body shape. So I proceeded with my usual alterations: a sway back adjustment and more rounded shoulders. I ended up creating a princess seam and adding little darts on the shoulders. I also thought that adding a bit of length will look more flattering on me. On the front, I also added my usual SBA by creating an additional dart which I will combine with the one which existed on the original pattern to create one bigger dart. After I marked all necessary alterations with a soft-tip pen, this is what I have. To transfer my alternations to the pattern pieces, I ripped my muslin apart and overlaid each piece requiring an alteration with the paper pattern. Then, using a tracing wheel with metal points (it's called "roulette" in Japanese but I've no idea about it's official name in English), I marked new lines onto the pattern. My absolutely favorite tracing tool! In the case with the second dart, I proceeded slightly differently: I did not trace it but added it to the original dart. Because there was some fabric separating two darts, I measured the width of the new dart and added this exact width to the old one. Here is a picture of a brand new pattern piece. I won't go into details about this particular pattern piece now, but if you are interested I can create a separate post explaining how I created a princess seam on the back. And after three hours working on my princess seam and re-drafting the sleeves, the end result looks fine in my eyes. 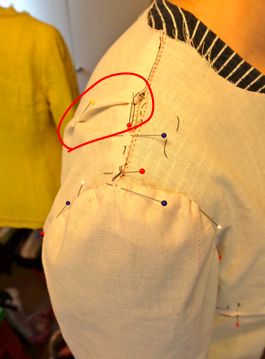 I have a little doubt about two areas of my jacket now: the sleeves' width and this little area circled in the photo below. But fear not, we will go for the second fitting once our jacket is cut from the real fabric and basted. Because, of course, the tweed and wool used for the jacket behave completely different from the muslin fabric. Would you like to share with us your alterations? If you have questions, feel free to post your photos to our Flickr group and we will all try to help you! Thanks for the step-by-step on day one of the Little French Jacket sewalong! I, too, am enrolled Susan's Craftsy class, and I know it will be invaluable! Thanks for the great instructions for fitting the muslin! My pcs are cut but will require lots of tweaking before it fits me. Oh wow. I'm not doing the jacket (sorry) but these are really useful. Thanks for documenting them so clearly and being so thorough in your instructions. I have an awesome knit blazer pattern from Knipmode that needs fixing up and this is exactly the incentive I need to get on with it. Cheers. Are these dead darts? I'm curious as to why you selected this pattern which necessitated adding princess seams in the back and darts. Also, are you using a 2-piece sleeve rather than a 3-piece one? Interesting different method on the muslin -- but I'm really partial to my thread basted lines! Gives me something to hold on to! I am divided as to whether I want to use my TNT french jacket pattern (which went through a muslin process to get where it is) or try a new one. I like both StyleArc patterns, I have the newer Claire Shaeffer Vogue, and a variety of other Chanel-ish patterns. What I like about the pattern I have already adjusted to fit is that it has shoulder princess seams rather than armscye princess seams. 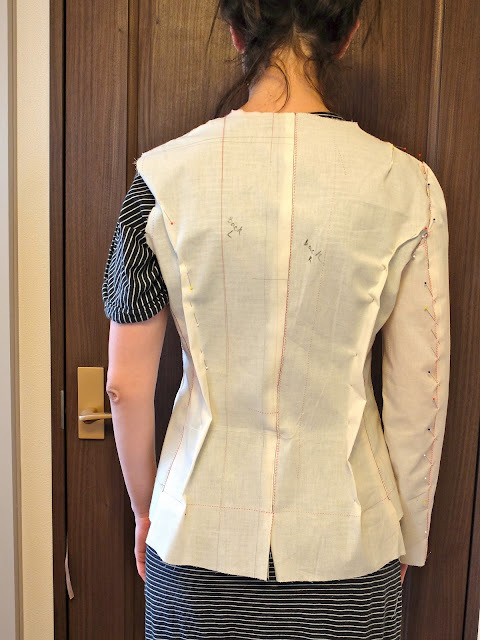 This seems easier to adjust from my narrow shoulders to the bust and back to the waist without having a lot of extra fabric pouffing out here and there. Thanks for the kick start Inna! Yes, I too enrolled last week for Susan's Craftsy course and although I've only watched a few 'episodes', there is a lot of detail in them. SO I just wanted to say well done on this post. I can't imagine how difficult it must be to get enough detail but not overload. Cheers! Susan's class is the best! I go back to it on a weekly basis: you always find there something new! I covered only my personal adjustments since this post would last forever. Good luck with your muslin! So I chose this pattern because I thought that this jacket would look nice on me even though I knew that my back is not great for this shape. I think we all go through this mistake from time to time: smitten by a pattern we don't pay much attention to whether it would fit our body shapes. Let's say, I wanted to fool myself but the muslin proved me wrong. And not, these are not dead darts but regular darts because I use them to accommodate curved areas of my body (sway back and rounded shoulders). Dead darts are usually smaller and are located of flat areas. Sorry if it was not too clear from the explanations. The pattern is a two-piece sleeve. Oh, Susan's class is my go-to resource whenever I have doubts. Both watching videos or reading comments bring incredible amount of useful sewing info! I can't wait to get hold on Susan's Jacket DVDs! Putting together the sew-along resulted to be quite challenging! It's always a compromise between the length of each post and the level of details.. Phew! If you want to provide me with more feedback about the sew-along, please don't hesitate! WOW You did an awesome work with the muslin! I´m not doing the sew-along but I´m going to follow all the steps! I've been eagerly awaiting this post! I have just been tracing my pattern and I'm wondering about the seam allowances. When you say large, what sort of size do you mean? 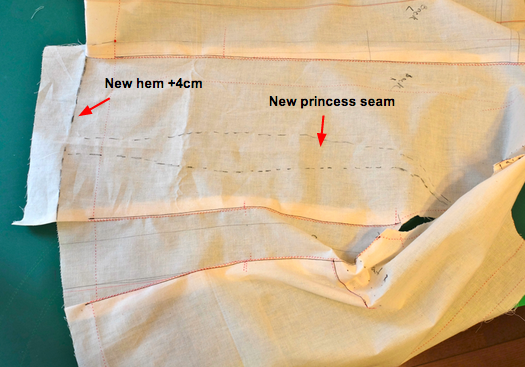 Is 2cm enough for the seam allowances with about 5cm added to the hem and cuffs, or would you add more? Thanks for the very informative first post, can't wait to get cracking on the muslin. Yea Knip do have a lot of different stuff don't they? You should try that pattern if you've got the time, it would be interesting to know what their pdf patterns are like. Check if they've got a copyshop version i.e. no cutting and pasting of ruddy A4s.. The printer I use out here has a large format printer and prints on Swedish tissue...♥ Actually I should blog about it-he totally deserves the coverage. The Knip block's got a bit more ease and height i.e. meant for taller people with an active lifestyle (which I imagine all Dutch people enjoy.. XD). Needs a pinch taken out of shoulder width (to get the shoulder point correct) and a couple of cm of heightremoved at the waist.. Will be interesting to see how you go. Thanks for the post. I"m looking forward to this sew-a-long. I'm going to work up the Style Arc 'Coco' pattern. Just need to find two coordinating fabrics to work with. Wish me luck. The sleeve conversion was not really planned for this sew-along...But let me talk with Leisa. Fitting sleeves is not only the least favourite thing (for all of us) but is the most annoying! For this reason we will allow two weeks for setting the sleeves. Good luck with your muslin! Hi Inna, thanks for the post. I'm making a muslin of V7975 but would prefer a V-shape neckline. Will altering my neckline mean looking for trouble? No facings, no interfacing, risk of distortion? You're an expert on this issue. Was it complicated to get the neckline right on your yellow jacket? Thank you Maider! I am sure you can pick up some elements of our sew-along which are possible to incorporate into other projects! Hopefully, it will be helpful for people who don't participate :) But, hey, you are working on a hell of a jacket! Good luck, Debbie! ( ͡° ͜ʖ ͡°) I am sure you'll find some beautiful fabric in no time! As we sew along, I'd like to hear more about your Style Arc's patter because I was keeping it on the top of my list. V7975 is a great pattern! Not to worry about the neckline at all! 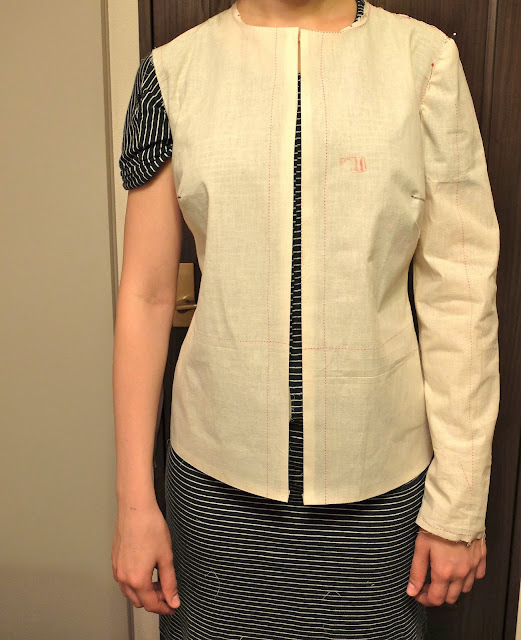 For the LFJ there is no facing, no interfacing but the risk of distortion is pretty low, unless you pull the fabric with all of your forces imagining that this is your manager •‿•) Believe me, the neckline is the least complicated part. But in case you are not completely sure about the neckline shape don't forget to keep really really large seam allowances: it's always easier to go from the standard neckline to a V-shape then the other way around. In our case 2-3cm seam allowances are enough. Use the knowledge of your body and your usual adjustments. 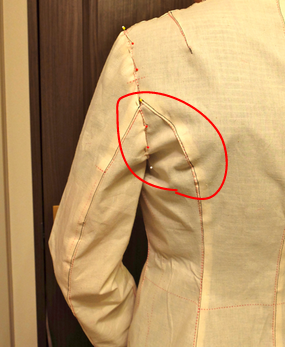 If you know that a certain area is tricky (for example, armscye or shoulers, allow slightly bigger seam allowance). In the worst scenario, you can either re-cut a new piece or add a little piece of muslin where necesary. For the hem and cuffs on a muslin, I usually do not add any seam allowances but cut at the seam lines. But this is just my personal preference. We will work with really large seam allowances for the fashion fabric (5-6cm depending on how much does your fabric fray). But this is our next topic which will be covered by Leisa next week! Claire Shaeffer's DVD Couture Techniques Workshop Basics explains how to thread trace. When done, you can easily tell the right side from the wrong side. She does recommend marking the top of each piece. It's really expensive on Amazon for some reason right now, but you can buy it form another source like overstock.com or half.com. The new edition of her book, Couture Sewing,, is also very helpful. And of course, she just came out with a book and DVD on sewing a Chanel-style jacket, which are excellent: Couture Sewing: The Couture Cardigan Jacket, Sewing Secrets from a Chanel Collector. Susan Khalje's The Couture Dress course is quite good, but I don't like being dependent on access to Craftsy. This is really useful. I'm still fairly new to pattern cutting and fitting concepts as I've only started dresses recently. I guess the constructive comment I can add to this post is that I've purchased the craftsy class "Sew the perfect fit" and found it helpful. The approach is a bit different apparently as it consists in cutting the muslin in strategic places and then either reduce the size of the muslin or insert extra fabric where needed. I have not practiced it yet but let's say it makes sense and the course covers top and bottom including various body shapes. Claire's book is is super interesting and useful but unfortunately I an unfamiliar with her DVD lesson. I use Macbook Air, which does not have a DVD port, and I prefer to store my information in the cloud and access it through Internet, hence my inclination toward services like Craftsy. But I think it's great that today we can choose the way we consume information! When you talk about thread tracing, is it related to the muslin? Is this the similar technique that I've described in the post? I would like to get hold of her book once it's available on sale where I live and to see the detailed photos of jackets. Exciting! Yes, thread tracing is the distinctive stitch used to mark the muslin and later, the actual fabric. It's a form uneven basting and creates a distinctive look on each side. Shaeffer explains how to mark seams and intersections. I understand why you prefer the Cloud. The DVD Basics workshop, however, is great for people with DVD readers because it illustrates many little issues that don't get explained elsewhere. I haven't had a chance to play the DVD that goes with Chanel-style jacket book, but the book is really good. Her book is available on Amazon.com. Is the shipping really expensive to Japan? I will get started next week! How long is your shoulder dart? Is it perpendicular to the shoulder? It's not 100% perpendicular. I just pinched in a few areas to see where it hides my "wings". I would not worry too much about the exact dart placement for couple of reasons: tweed or bouclé are not as sturdy as cotton or wool and any little imperfection won't show but also the jacket is usually worn opened, so there will be lots of movement for somebody to catch the sight of it. This needle point tracing wheel looks pretty aggressive :) Is it for working with leather? People with cloud are so dependent on a good Internet connection if any! If I lived in a remote area with a dial-up Internet I think I would value DVD or any other hard copy sources more, for sure! Amazon.com does ship to Japan and the cost is acceptable. But within three weeks I will move to London where this book is still not on sale. It does not make sense for me to order the book now and add more weight to my already over oversized luggage (•ิ_•ิ)? So have to wait ! Thanks for your feedback on "Sew the Perfect Fit". Again, it's a good thing to know a few different ways of working with a muslin or pattern and use the one which works best for you. I also find my fitting techniques considerably improved when fitting clothes on other people. method. I have never tried the method with basting but will try it. I have just found this sewalong and really want to join in. I have made V7975 up before in a Chanel style but there definitely isn't any hand sewing or quilting in that one. I also have another version of V7975 on the table that is true to the little french jacket (it has quilting, a lot of handsewing etc) but after reading everyone's comments, the blog posts and the silk tweed mix that followed me home the other week, I want to do this. Seeing I have already had my jacket fitted for me, I won't do the muslin and will wait for the next lot of instructions. One question though, I can't find any mention, do we pre-treat our fabric? Hi Sharon! I am very excited to see you join it :) There are never enough of French jackets, aren't they? Next week Leisa will talk about cutting the fashion fabric and will cover the question you asked. In my case, I don't do anything crazy with my wool/tweed: no London shrink, no dry cleaning, no washing. I just steam my fabric with an iron once or twice. Same goes for chêpe-de-Chine. I never had problems with any garments post-washing or dry-cleaning. Jenny, Emily and I spent this last Saturday at mine doing draped pants blocks from the Duburg book. I'll prob be doing one for Maria (velosewer) when she gets here next month 'cuz we got a sleepover scheduled XD OMG so glad I started blogging about sewing-cool people everywhere. Just link to a pre-existing tutorial or scan a book page under 'fair-use'. Don't spend a lot of time on things that everyone ain't doing. Just ma two cents. Cool-so does that cover fitting menswear as well as women's wear? Or are there just suggestions that would work irrespective of the style? the class covers all the basics about women's wear, nothing about men's wear I'm afraid! I admire you and Leisa to take the effort to share your learning with all of us. The LFJ is the most versatile jacket I have ever made. Since March 2012, my class with Susan, I am now finishing my 6th jacket. Having read your blog I wonder why you choose the pattern with the classic princess line. If you look at the Vogue 7975 pattern the princess seams are moved to the shoulder, which has two advantages: you can incorporate the back and front dart in this seam and the quilting is easier with the straighter lines. I also have rounded shoulder blades and prefer a more fitted style and that is perfectly possible when you move the seams to the shoulder. I must say I have not read all the comments, so maybe you have already answered this question. Seam allowances? ? 5/8" hangover. Going to work at this till it's like I've never heard of 5/8"
Well, we work with stitching lines for more precision and better fit. Try this out! You'll love it!